Margaux partnered with Jane Creative Studio to take their innovative concept of custom shoe design and create a digital experience that delights, inspires, and informs their target audiences. Margaux re-envisioned the classic flat for the modern woman. They commissioned Jane Content Studio to translate their brand experience into an engaging Ecommerce platform. With the help of Jane Creative Studio, Margaux launched an entirely new online Ecommerce website in which the unique shoe brand aimed to shift consumer expectations around omni-channel shopping experiences. The brand's poise and elegance was not accurately reflected within their online presence. The site initially faced a series of limitations from a user experience and functionality perspective, making the process of ordering a made-to-measure pair of shoes a difficult endeavor, thus often leaving consumers empty-handed. Jane's challenge was to create a digital experience by seamlessly weaving together content and product as tailored to Margaux's key demographic. Now, 50% of more users are staying on the site longer and engaging with the content and products than before. Because there are countless ways that customers can shop on Margaux, Jane highlights the options upfront for a streamlined user experience. The “How it works” section also communicates to shoppers the benefits of the services–when compared to services offered elsewhere. The color wheel is an integral part of the Margaux brand; Jane Creative Studio took this concept one step further by creating an interactive color wheel on the home page to showcase each color in The Classic collection. A brand is not just an image, it's a lifestyle. The custom designed blog gives Margaux its voice and the ability to come alive with fresh, original content to keep customers up to date on the latest from the brand. 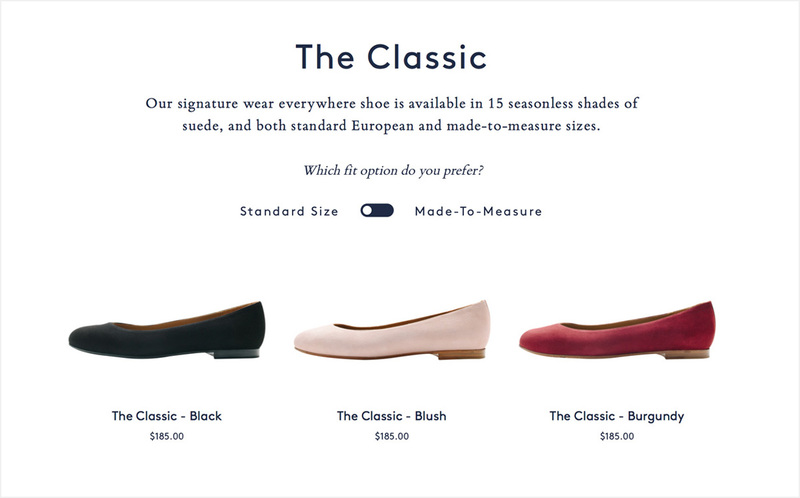 Margaux's unique selling point is that it offers two sizing options for their customers to ensure a perfect fit. 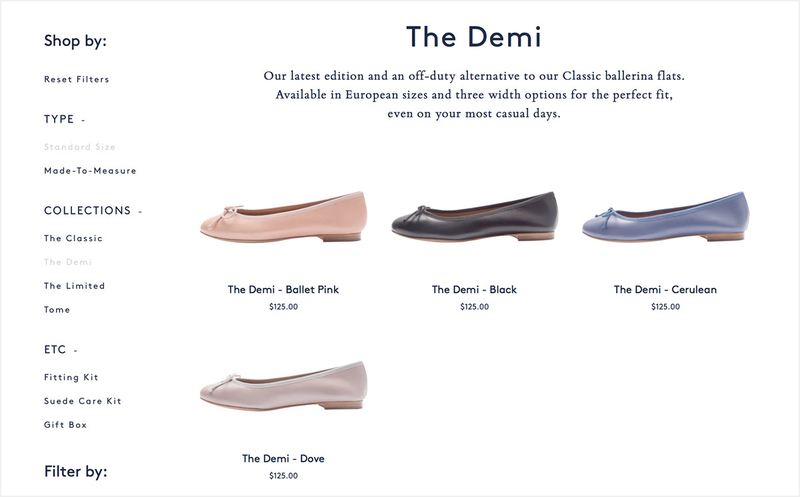 A standard, ready-made European fit is designed for shoppers who want their shoes immediately. Shoppers can also opt for a unique made-to-measure fit that is tailored to exact measurements. One of the challenges Jane faced was to showcase both options and different prices while communicating the benefits of both fits. 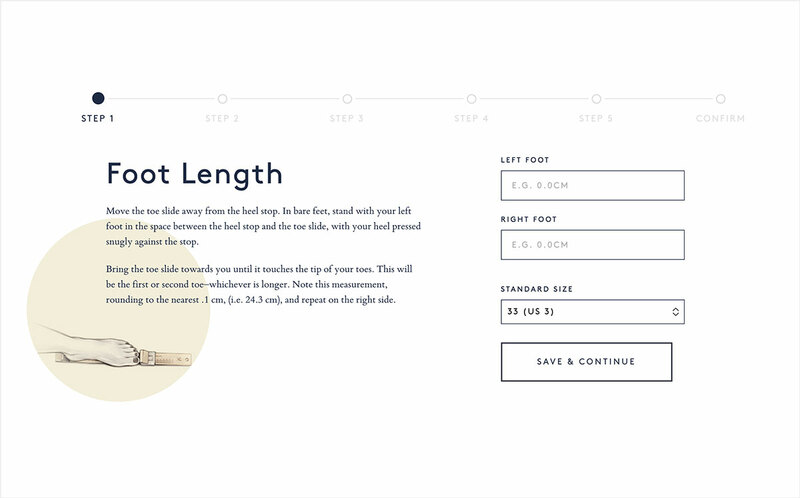 Jane utilized a toggle bar on the shop page, allowing users to switch between standard and made-to-measure prices. This will also reveal whether or not the shoe is available in made-to-measure. Users can also sort through the sidebar and shop by which fit they would like to browse. The sidebar also includes filters for colors, sizes and collections. Under the Made-to-Measure tab on a product page, logged in users can select a measurement that they would like to use to order their perfect fit. There are multiple ways in which customers can find their perfect fit. 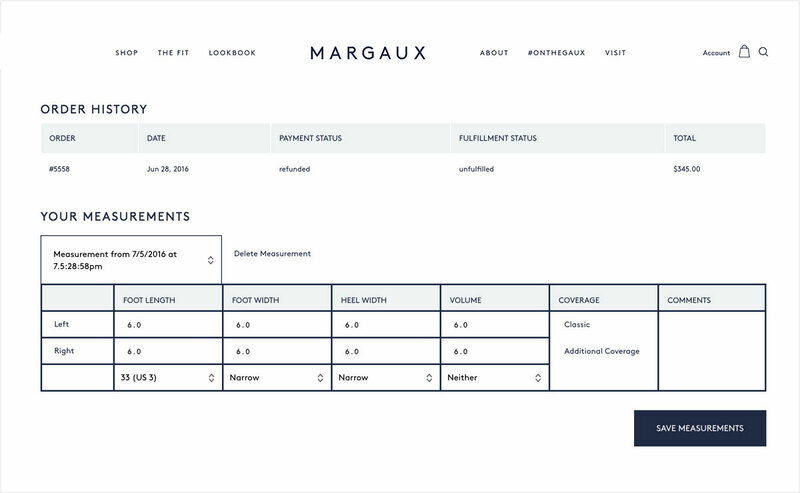 When the brand first launched, Margaux sent customers fitting kits that would simplify the measuring process at home. Since then, they have rolled out at-home appointments and opened a studio in New York for fittings. For customers who opt to order a fitting kit, there is a step-by-step measuring process that allows them to accurately measure their feet to comfortably fit into a custom Margaux flat. Jane optimized the measuring experience by adding a progress bar, which better informs users on how close they are to completing the measuring process. Customers expressed a desire to see the collections and colors in person, so Margaux opened their studio for by-appointment fittings. After customers complete the measuring process, it is saved on their personal account page. In addition to housing their addresses and orders, the new account page allows customers to view, edit, add, and delete their measurements. Whether they want to add a friend’s custom measurement to gift later on or add multiple measurements for other friends and family, their information will be saved and will be accessible for future use anytime, anywhere. A Margaux Gaux Girl is well-read, engaged, and always on the go, and the new eCommerce experience reflects that lifestyle. From its minimal elegance to bold typography and images, the design system is solely focused on highlighting the brand and the products. The shopping experience is now a smooth, integrated experience from desktop to tablet to mobile. To facilitate an seamlessly integrated experience, “Shop Now” moments were incorporated throughout editorial content. 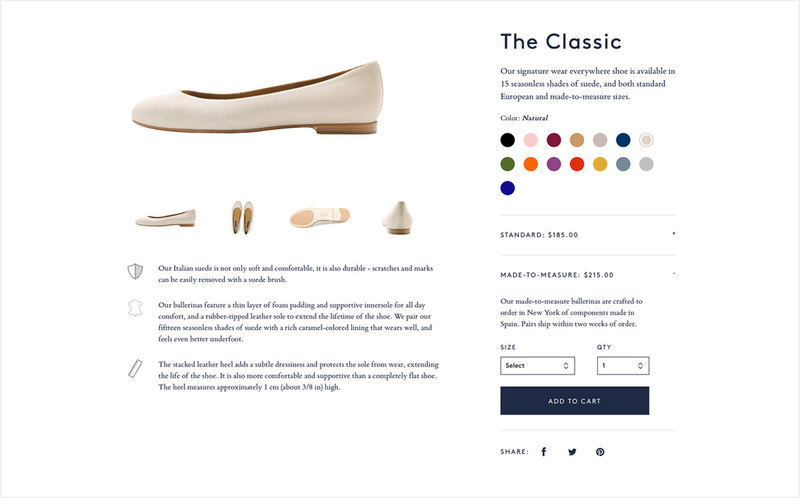 Buying a pair of made-to-measure flats from the Classic collection became just as effortless on mobile as on desktop. From adding an item to the cart to the confirmation of the order, the Margaux site was designed so the shopping process became a seamless experience.